American marten. Image: Wisconsin Department of Natural Resources. When it comes to wildlife at Isle Royale National Park, most eyes are on the wolves and moose. Both are iconic species long studied by scientists and long sought for viewing by visitors to the isolated spot in Lake Superior. And now, after a three-year study, the National Park Service is starting to implement a 20-year plan to restock wolves on the island to help restore a predator-prey balance with moose. But the 17 other mammal species on the island draw far less scientific and public attention although other species have disappeared, such as the Canada lynx and woodland caribou. Another one that had been wiped out – the American marten – is back and drawing attention from National Park Service and University of Wisconsin Madison researchers. Their return through as-yet-unproven means was evidenced later by tracks and confirmed in 1993. So how did these members of the weasel family get back? One, the Park Service started a program in 1966 to collect martens in Ontario and relocate them on Isle Royale — but there’s no documentation showing that actually happened. 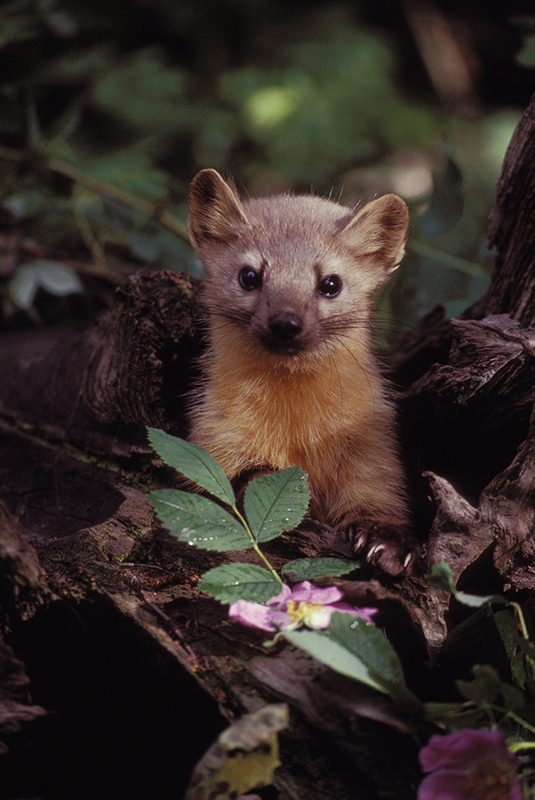 Two, a marten colony “persisted undetected for much of the 20th century” – in other words, surviving under the radar of scientists and park managers, which is considered unlikely. And three, they could have recolonized Isle Royale by crossing an ice bridge from Ontario, the nearest mainland 22 miles away. That sounds like quite a feat for critters that weigh only 1.1 to 3.1 pounds. But the ice bridge route is the most logical mechanism for their return, according to co-author Jonathan Pauli, a wildlife ecologist at the University of Wisconsin. Isolated as the island is in Lake Superior, its wildlife have undergone dramatic changes over the centuries. For example, the study noted that beaver were wiped out in the 1800s but managed to return on their own. Humans probably introduced foxes for fur farming. Moose replaced caribou as the dominant plant-eaters. And white-tailed deer were introduced but soon wiped out. Minnesota and Ontario martens have been reintroduced in Wisconsin and elsewhere in Michigan, and Colorado martens were released in Wisconsin. Between the 1800s and now, there have been projects to reintroduce martens in 16 states and six provinces, making it the carnivore most often translocated in North America. As for the prospects of long-term survival of the Isle Royale’s marten population, there are lots of unknowns, Pauli said. One unknown is what’s on their menu. “Isle Royale has been a place where we’ve learned an incredible amount about predator-prey interaction of moose and wolves but know little about other mammals there,” he said. Scientists know that martens elsewhere eat snowshoe hares, red squirrels and deer mice but don’t know their foraging habits on Isle Royale. Wolves weren’t a factor in the martens’ disappearance a century ago because none were on the island then. And Pauli expresses little worry that the island’s new wolf population – as many as six this fall, the Park Service says – will threaten martens, given the huge supply of moose to feed on. Also, wolves may supply a food source for martens – provisioning, as it’s called – when they leave some meat behind after killing a moose. The fact that the Park Service prohibits trapping on the island is a plus, as is the fact that its wilderness status protects the big trees and downed debris that provide good marten habitat, he said. Other unknowns: how many martens live on the island or their reproduction and survival rates, Pauli said. A small population could be vulnerable to random, unexpected events like a series of drought years. However, he said uncertainty about the impacts of climate change and warming temperatures in and around the Great Lakes raises questions about the likelihood of future ice bridges that could bring other carnivores to Isle Royale.